Watch: Timelapse footage of Mayon Volcano erupting on Jan. 22, 2018 - Balita Boss! 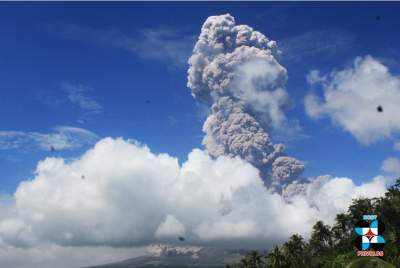 Mount Mayon in Albay province erupted on Monday, January 22. Watch below the footage of Mayon Volcano, shared on the Facebook page of Legazpi City, erupting and sending a huge gray column of lava fragments, ash, and steam into the sky. According to Philippine Institute of Volcanology and Seismology (PHIVOLCS), The phreatomagmatic eruption of Mayon Volcano at 12:43 PM produced a 5-kilometer high eruption column. The PHIVOLCS raised its alert on Mayon to level 4, signifying an eruption is due within days or hours. The danger zone around the the Philippines’ most active volcano has been expanded to a radius of 8 km.